Two islands in the Canary Islands and one in the Balearic -Fuerteventura, El Hierro and Majorca- are the proposed to benefit from the ‘I Call for Intelligent Islands’, launched by the Ministry of Industry, Energy and Tourism, through the public company Red.es, as part of the Digital Agenda for Spain. The call had a budget of 30 million euro and following the assessment of the projects according to the tender conditions, a draft resolution has been approved with three beneficiary projects: ‘Smart Island Mallorca’ (€ 8,876,245) ‘Fuerteventura Open i-Sland’ (€ 6,556,533) and ‘El Hierro en Red’ (€ 3,852,670), totaling more than 19 million euro that will be 100% financed. Now the beneficiary administrations have to accept the aids and meet the administrative requirements provided in the call, before a firm resolution is given. These initiatives are likely to be co-financed through the European Regional Development Fund (ERDF). The aim of the ‘I Call for Intelligent Islands’ is to promote projects that integrate intelligent island strategy, contribute to the improvement of public services of the territory and that are aimed at mitigating the negative effects of insularity, through the use of information and communication technologies (ICT). The maximum budget per initiative was 10 million euro and financing is fully covered by the Ministry of Industry, Energy and Tourism through Red.es says MINETUR in a press release. 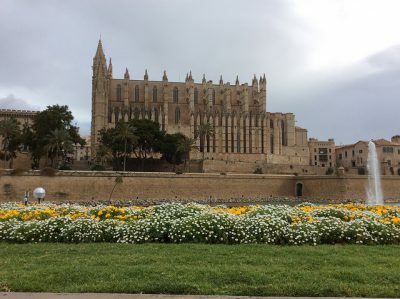 This project, presented by the Consell Insular de Mallorca, proposes the technological management of the island by implementing an intelligent platform and performing a series of actions in order to adjust seasonal tourism on the island. One of the main activities is the creation of the platform Smart Island and a corporate Geographic Orientation Guidance (GIS for its acronym in Spanish). In addition, in the tourism area another platform will be created, the tourist office will be digitally transformed, interactive panels and public WiFi hotspots will be installed and tourist flows will be analyzed, among other actions. There will also be actions in the field of heritage and mobility, with the installation of weather stations, traffic flow sensors, smart parking and bus stops. In addition, energy efficiency, resilience and open government actions are proposed. The ‘Fuerteventura Open i-Sland’ initiative, presented by the council of this island, aims to develop shared services, bridge the digital gap and improve the services provided to citizens. The project is structured around three main lines of action. The first focuses on good governance, with actions on digital public services for citizens, both from the Cabildo of Fuerteventura and from the island municipalities. The second major initiative is the creation of a Data Processing Center (DPC) and a Shared Services Center (CSC), which includes hardware and software infrastructure and the Smart Island platform. Third is the iLight Project, the first vertical service for solid waste management and road lighting in roundabouts. The project presented by the Cabildo de El Hierro is divided into three areas: sustainability, smart governance and security and emergencies. The first includes activities in the fields of mobility, waste management and tourism and economy. The second, meanwhile, aims at providing citizens data available on the council and those generated in the future, for which it proposes the implementation of an intelligent platform. The last line of work seeks to complete essential aspects of ICT services for prevention and response in case of natural disasters or emergencies in general. The development of the three lines comprises 22 concrete actions, which are structured along two major milestones: improved communications and implementation of an intelligent platform. The ‘I Call for Intelligent Islands’ is one of the measures promoted by the Smart Cities National Plan of the Digital Agenda for Spain, approved in March 2015 that has a budget of 188 million euro for the period 2015-2017.